The signal expansion (11.104) can be interpreted geometrically as a sum of orthogonal projections of onto , as illustrated for 2D in Fig.11.30. Figure 11.30: Orthogonal projection in 2D. where is some normalizing scalar dependent only on and/or . Thus, in a biorthogonal system, we project onto the signals and resynthesize in terms of the basis . The following examples illustrate the Hilbert space point of view for various familiar cases of the Fourier transform and STFT. A more detailed introduction appears in Book I . This expansion was used in Book II  to derive the impulse-response representation of an arbitrary linear, time-invariant filter. The inner product and reconstruction of in terms of are left as exercises. and is the DFT length. When successive windows overlap (i.e., the hop size is less than the window length ), the basis functions are not orgthogonal. In this case, we may say that the basis set is overcomplete. The parameter is called a scale parameter (analogous to frequency). The normalization by maintains energy invariance as a function of scale. We call the wavelet coefficient at scale and time . The kernel of the wavelet transform is called the mother wavelet, and it typically has a bandpass spectrum. A qualitative example is shown in Fig.11.31. 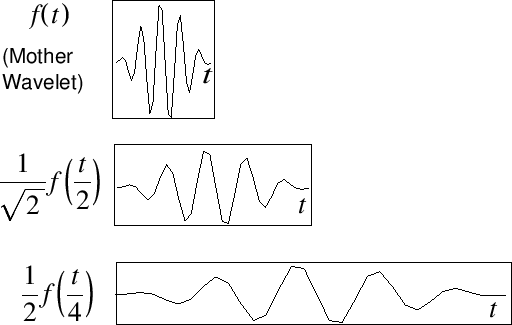 Figure: Typical qualitative appearance of first three wavelets when the scale parameter is . Given sufficient decay with , this reduces to , that is, the mother wavelet must be zero-mean. In this case, we have , which is close enough to zero-mean for most practical purposes. 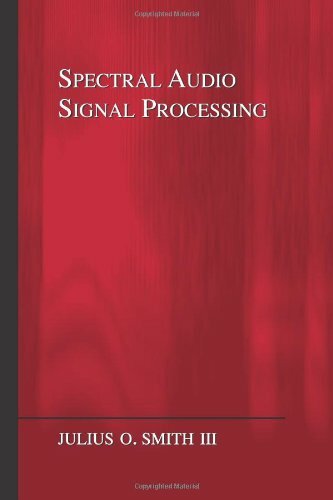 Since the scale parameter of a wavelet transform is analogous to frequency in a Fourier transform, a wavelet transform display is often called a scalogram, in analogy with an STFT ``spectrogram'' (discussed in §7.2). When the mother wavelet can be interpreted as a windowed sinusoid (such as the Morlet wavelet), the wavelet transform can be interpreted as a constant-Q Fourier transform.12.5Before the theory of wavelets, constant-Q Fourier transforms (such as obtained from a classic third-octave filter bank) were not easy to invert, because the basis signals were not orthogonal. See Appendix E for related discussion. where and range over the integers, and is the mother wavelet, interpreted here as a (continuous) filter impulse response. which does not depend on . Thus, the th channel-filter is obtained by frequency-scaling (and normalizing for unit energy) the zeroth channel filter . The frequency scale-factor is of course equal to the inverse of the time-scale factor. Recall that in the STFT, channel filter is a shift of the zeroth channel-filter (which corresponds to ``cosine modulation'' in the time domain). As the channel-number increases, the channel impulse response lengthens by the factor ., while the pass-band of its frequency-response narrows by the inverse factor . Figure 11.32 shows a block diagram of the discrete wavelet filter bank for (the ``dyadic'' or ``octave filter-bank'' case), and Fig.11.33 shows its time-frequency tiling as compared to that of the STFT. The synthesis filters may be used to make a biorthogonal filter bank. If the are orthonormal, then . 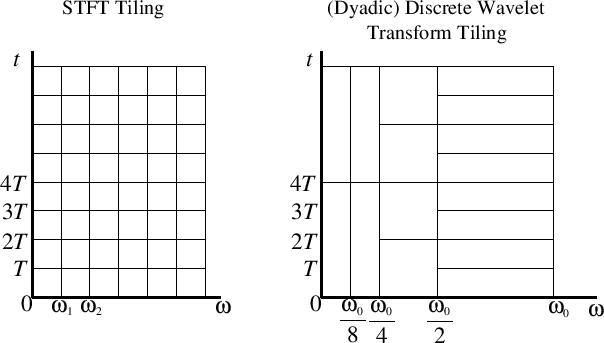 Figure 11.33: Time-frequency tiling for the Short-Time Fourier Transform (left) and dyadic wavelet filter bank (right). Design of dyadic filter banks using the window method for FIR digital filter design (introduced in §4.5) is described in, e.g., [226, §6.2.3b]. A ``very easy'' method suggested in [287, §11.6] is to design a two-channel paraunitary QMF bank, and repeat recursively to split the lower-half of the spectrum down to some desired depth. This filter bank and its reconstruction are diagrammed in Fig.11.35. The analysis filter is typically complex bandpass (as in the STFT case). The integers give the downsampling factor for the output of the th channel filter: For critical sampling without aliasing, we set . The impulse response of synthesis filter can be regarded as the th basis signal in the reconstruction. If the are orthonormal, then we have . More generally, form a biorthogonal basis.